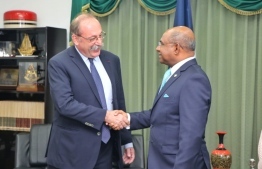 Minister of Foreign Affairs Abdulla Shahid, on Sunday, requested visiting French Ambassador Eric Lavertu, to extend France's support towards establishing a Visa Centre in Maldives. At the meeting held at the ministry, Shahid expressed hope that relations between Maldives and France would be strengthened under the ambassador’s tenure and congratulated the ambassador on his recent appointment. In addition to assisting the facilitation of Schengen Visa to Maldives, the two diplomats discussed trade promotions including zero tariffs on Maldivian fishery products. Minister Shahid was accompanied by State Minister Ahmed Khaleel and Director Shiuneen Rasheed.